Color Club Age of Aquarius | Light Your Nails! 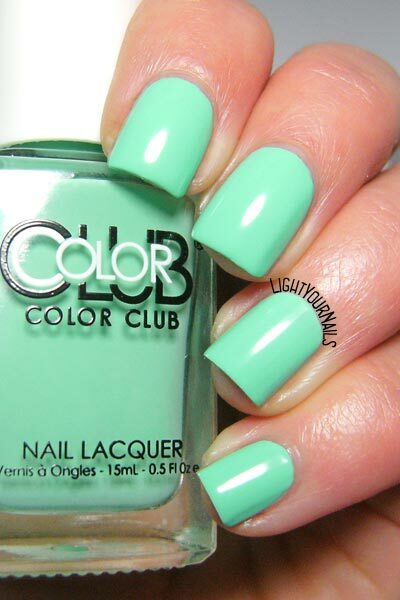 Today I am showing you Color Club Age of Aquarius*, a mint green nail polish which is both pastel and neon. How weird and yet cool of a combo is that? Formula is typical of both pastels and neons, these finishes have some similar qualities for sure. Formula is thick and it dries so quick that it is really hard to work with. It dries semi matte so you definitely need a top coat both for shine and to smooth out the surface. If you are okay with such a difficult application you will get an awesome result though. Photos: two coats plus top coat. I love this bright shade, and the pastel + neon combo was a real surprise to me. If only it were easier to apply! What do you think? Do you like it? And can you think of something similar with an easy to work formula? Premetto che di persona non l'ho vista, ma secondo me gli Electric Nights sono più bright che neon! Davvero? A me piace talmente tanto che l'ho indossato da solo finchè non si è rovinato! Grazie! Piace un sacco anche a me! This is such an awesome shade! I want I want! I know the feeling. It's been in my wishlist forever until I could finally have it!